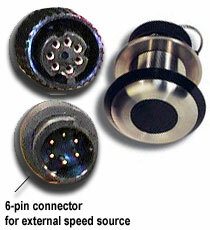 The term transducer is commonly used in two senses; the sensor, used to detect a parameter in one form and report it in another (usually an electrical or digital signal), and the audio loudspeaker, which converts electrical voltage variations representing music or speech, to mechanical cone vibration and hence vibrates air molecules creating acoustical energy. This energy can be displayed on a graphical display such as a fishfinder or Marine Multifunction Display. Marine transducers are designed to withstand water pressure and reasonable use. They can not withstand serious mechanical shock, and should be cleaned every time the vessel is removed from the water. We carry a wide range of transducers from premier manufacturers, ensuring you get the right fit for your vessel and application.